Although a German word, Pumpernickel (which in what follows will not be capitalized) seems to be sufficiently familiar to the English-speaking world not to require a gloss. The origin of the bread (Westphalia, and there perhaps the town of Osnabrücken) has been ascertained, but the etymology of the name remains a puzzle—at least to some extent. It would have been almost impossible to collect the countless publications on this word without an exhaustive survey by Kurt Ranke (1954), an outstanding folklorist and dyed-in-the wool Nazi, a scholar who returned to a university career shortly after the war and was embraced by academia with open arms. Too bad, talented people so often turn out to be scoundrels. Those who know enough about the career of Jan de Vries, a great Dutch Germanist, will agree. All the earlier attempts to trace pumpernickel to its etymon failed because they assumed that everything had begun with the name of the bread. Ranke showed that this idea was wrong. Carin Gentner, who brought out her investigation on pumpernickel in 1987, two years after Ranke’s death, mentioned her illustrious predecessor in passing, but her material and conclusions contain little that is new. Documents show that pumpernickel has been attested with many senses: “different kinds of bread,” “a short fat man (or child),” part of the phrase connected with the custom of ‘singing Pumpernickel’ (the meaning of the phrase is no longer clear, but the reference is to something unconventional and often obscene; sometimes fisticuffs and the like are at the center), and “the hero of a children’s song about someone called Pumpernickel” (he is often in trouble and becomes everybody’s laughingstock). Westphalia is situated in the north of Germany, but the word pumpernickel and the character bearing this name have been recorded all over the country, including its southernmost regions. In popular literature, one can read fanciful explanations about how the word pumpernickel came about. Most of them center on some episode in the history of the heavy bread made with coarsely ground rye: either a French soldier expressed his disgust of the food a Westphalian peasant offered him, or a kind-hearted bishop fed his starving flock with it. But, as noted, pumpernickel is not tied to the Osnabrücken region. Besides, the name does not always designate course bread. In Vienna, the well-known Lebkuchen is called this; it resembles gingerbread and is a Christmas treat baked with almonds. The word made its way into several countries outside the German speaking world, including France, and its foreign offspring are neither heavy nor coarse. No mention of pumpernickel in published sources predates the beginning of the seventeenth century. The word also occurs as pompernickel and bombernickel, but both are phonetic variants of pumpernickel and add nothing to our search. Of real importance is the fact that already in the first third of the seventeenth century Pumpernickel sometimes meant “devil.” The name as applied to Westphalian bread appeared in documents and books some time (though not considerably) later, and perhaps the short chronological gap reflects reality: first the devil (a rather than the devil), then “devilish” bread. Despite the general uncertainty surrounding the derivation of pumpernickel, the origin of the first element poses no difficulties. In the post on bogey, I listed some b-g and p-g words that denote swelling, a noisy explosion, and so forth. Bomb and pomp were among them. Pump, pamper, and even pimp belong there too. A pimp (like the German Pimpf) was a youngster, a weakling unable to produce a big pumpf, that is, fart. Pamper refers to stuffing one with food (hence spoiling). Pumper-, as has been known for a long time, carries the same connotations. Despite the occurrence of the word from Osnabrücken to Vienna, it must have been coined in the north, for otherwise it would have had pf in place of p, at least after m. Whoever Pumpernickel was, he must have been able to produce a lot of noise, probably by breaking wind, though it is not improbable that he, like Bogey, deafened people in some other way. Pumpernickel emerges as a vulgar clown, a prankster, the hero of drunks and whores, a figure typical of low popular culture, like Til Eulenspiegel, the protagonist of scatological tales, Richard Strauss’s symphony piece, and Charles de Coster’s magnificent prose epic. Less clear is the origin of –nickel. German etymologists are reticent on this point, but most probably we find ourselves in the presence of our friend Old Nick. As Charles P. G. Scott pointed out, in English, Nick is an abbreviation of Nicol. There indeed was a devil bearing this name. And here comes my hypothesis. It did not occur to others because they did not realize that Old Nick was a sibling of Nickel. This is what I meant when I said that etymologists never know enough. I believe that mercenaries and those who accompanied the troops made the petty devil Nickel also famous in England. It cannot be fortuitous that Old Nick and pumpernickel are such close contemporaries in the two countries. I suggest that Nick in Old Nick is a borrowing from German. If my conclusion is right, then Old Nick has no roots in medieval European folklore. St. Nicholas (our Santa Klaus) need not worry about his disreputable namesake (unless someone succeeds in showing that there is a connection between them after all). The Old Germanic crocodile (nicor ~ nihhus) fades out of the picture. Nixes and nickers are one thing, and Old Nick is something quite different. 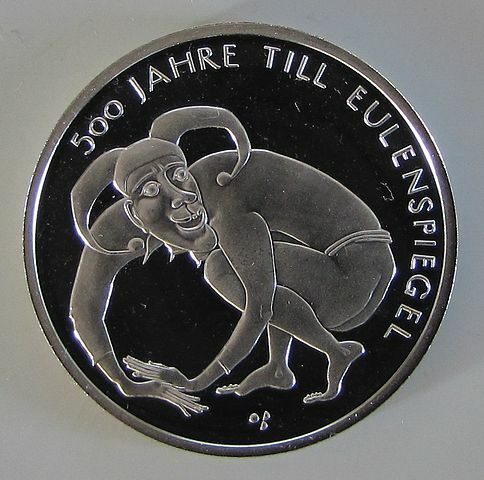 Image credit: 10 Euro Gedenkmünze 2011 – 500 Jahre Till Eulenspiegel, PP, Bildseite. Public domain via Wikimedia Commons. Using Swedish elevators (house lifts) in the 1960th, one could see the sign “I fart” meaning “Moving” or “Occupied” and I’am rather sure, that it was due to use of eletric energy! To the serious department! “The only good result of the war was the spread of the word pumpernickel, ..” A rhetorical question on that: Would the position of the Germanic languages today have been the same without the Thirty Years’ War (1618-1648)? Lift/elevator in motion; On the occasion of the visit of Queen Eliazabeth II to Copenhagen the sign I FART was masked. There’s a big suspension bridge at MIDDELFART in DK.